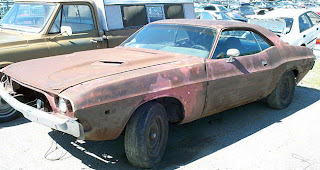 Complete 1970 Dodge Challenger for sale at Baughman's junkyard in York, PA.
Crushing end for historic junkyard, mystery solved. The soon-to-be closed Baughman's Auto Salvage near Dover, Pennsylvania has been home to 21 Tri-Five Chevys and more than 900 other vehicles ranging from mid-1930s to late 1970s models for several decades. 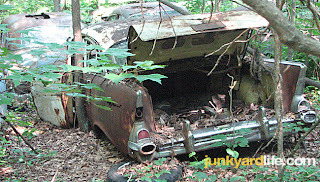 Junkyardlife recently posted photos and requested info about the 1957 Chevy Bel Airs and 1957 Chevy station wagons rusting in the woods. John Baughman, the junkyard's owner has the answers, some of which may be painful to learn. Seven years ago Baughman purchased C&B Salvage, a rural salvage yard with a vast inventory of classic domestic cars, including the Tri-Five Chevys, in Dover, PA. The Dover yard, surrounded by farmland, for the better part of its 45 years of existence, was recently targeted as a nuisance by new residential developments. 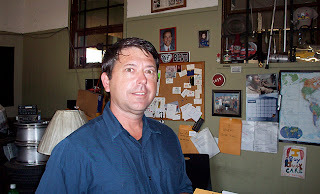 A battle with city government combined with the influx of white collar homeowners who didn't understand why they should be subjected to living near a junkyard forced Baughman to close the junkyard. "They're trying to yuppify the whole town," Baughman told 'Old Car Weekly' in a November 2010 article. John Baughman, owner of Baughman's Auto Parts in York, PA. John's other yard, Baughman's Salvage Yard in Dover, PA., is closing, 900 cars will be crushed and cleared from the property. After Baughman's cars are crushed and the land is cleared of all traces of 45 years of salvage yard scabs,he plans to sell the property. "The land is worth more to developers, so I'm selling it." Business boomed when word spread that Baughman's Dover junkyard was closing by the end of December 2010. "We sold a sh!t load of stuff," Baughman said. Car enthusiasts searching for rare parts flooded his Dover yard as closing day loomed. Hard to find parts for obscure domestic models such as Edsels, LaSalles, Hudsons and Studebakers were scavenged by old car mavens. 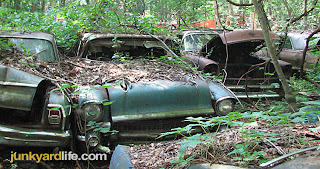 About 100 foreign cars, including a 1950s MGA, could be found by diligent junkyard nomads in Baughman's yard. 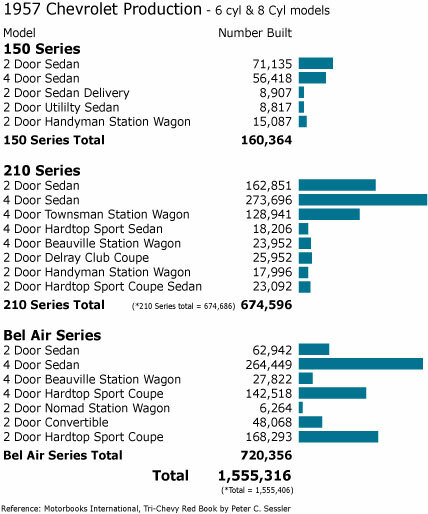 What happens to the classic cars? 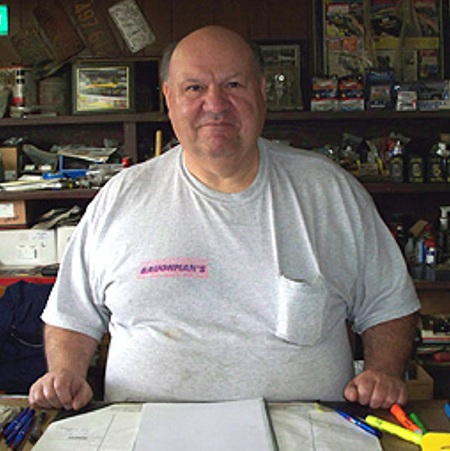 Baughman plans to save the most valuable cars and parts from the Dover yard and move them to his other yard, Baughman's Auto Parts in York, Pennsylvania, which he opened in 1985. "We've got 21 Tri-Five Chevys and a guy just found a 390 cubic inch V8 Mercury Marauder engine with solid lifters and 11:1 compression," said Baughman. 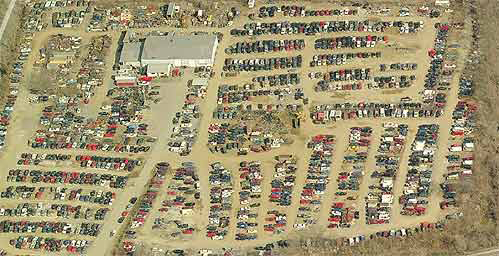 The York yard, comprised mostly of late model vehicles, will see a few of the complete cars from the Dover yard. A couple of complete Mopars are for sale on Baughman's website. 1973 Dodge Challenger for sale at Baughman's York, PA. Auto Parts. A car crusher has been working on the Dover yard for the past two weeks, crushing over 200 cars. "We have 700 more to crush and tons of parts to pick up off the ground. When you crush cars, parts fall all over the place," said Baughman. "Its a big job that we are doing as fast as we can." Current scrap prices are bringing Baughman $14 per hundred pounds. Scrapping out the entire yard should net more than $200,000. Recent snow storms have not cooperated with Baughman's plans to clear the land of the multitude of metal. "We just got 6-to-8 inches of snow covering everything up, which is going to slow us down." 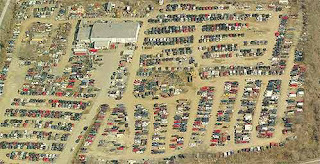 Thousands of desirable parts and dozens of restorable project cars will be lost amid the acres of vehicles being crushed at Baughman's. 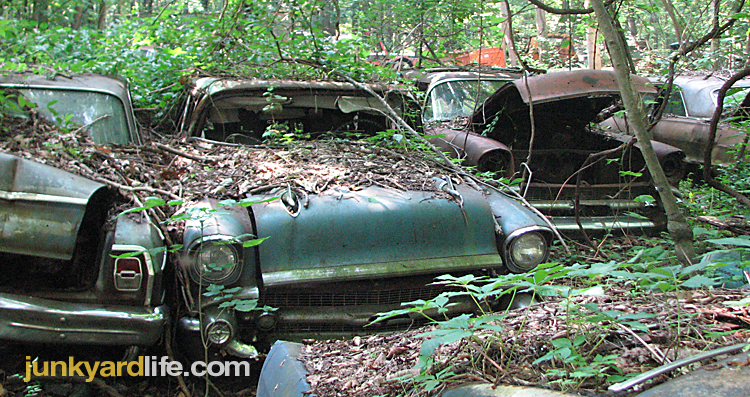 Older junkyards are a glimpse at a simpler time when cars were repairable and worth remembering. Each day a junkyard closes, the number of salvageable parts and vehicles diminish. 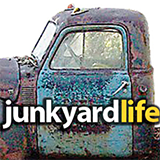 It will be a sad day when the last load of '50-era parts leaves the junkyard on a scrap truck. Baughman's Auto Parts in York, Pennsylvania will be home to the "good stuff" leftover from Dover junkyard. 1957 Chevy with fangs? Not really, just factory bumper guards on this Tri-Five in a Pennsylvania junkyard. More 1957 Chevrolets to lose sleep over. Ron Kidd's mid-summer trip to Pennsylvania resulted in the discovery of a long-forgotten junkyard. 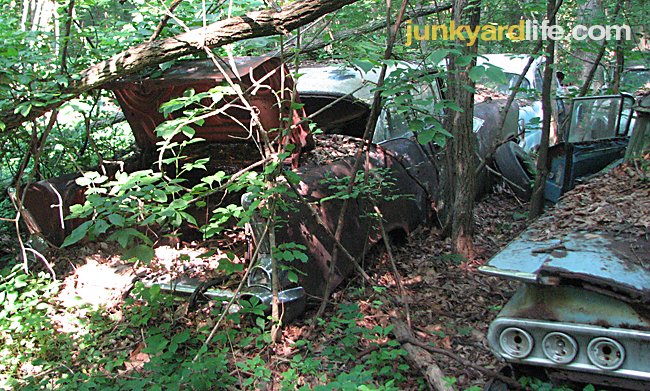 The junkyard, 24-miles south of Harrisburg, in Dover, Pennsylvania had been closed for decades. Rumors of the salvage yard's demise and sell-off of all cars and parts spread like wildfire across the mouths of Carlisle-bound car enthusiasts. Kidd sacrificed a day at the GM Nationals in Carlisle, PA. to bring you these photos of final year Tri-Five Chevys. Two 1957 Chevys flanked by a 1964 Chevrolet Nova and a 1964 Impala. 1957 Chevy 4 Door Sedan. 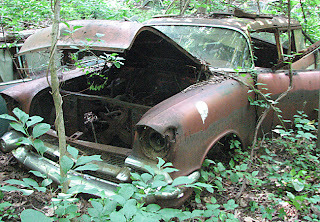 Not much remains to identify it as a Bel Air, 210 or 150 series. Tropical Turquoise paint is revealed underneath a dark blue repaint (Harbor Blue perhaps?) on this 1957 Chevy 4 Door Sedan. Fin-tastic! A 1957 Chevy's vertical fins sits next to a 1960 Impala's horizontal bat wings. 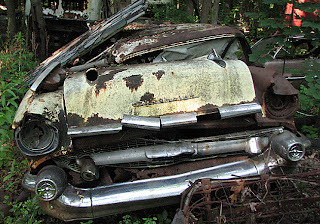 This 1957 Chevy 2 Door Bel Air sat among dozens of dilapidated classics in a Pennsylvania junkyard in July 2010. 1957 Chevrolet Bel Air Townsman station wagon. 1957 Chevrolet wagons are hidden in the backwoods of Pennsylvania junkyard. A mid-summer trip to the GM Nationals in Carlisle, PA., by Ron Kidd and fellow gearhead road-tripper Anthony Powell, took a slight detour to a long-forgotten junkyard. 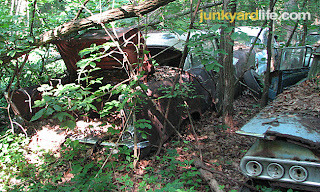 The duo followed a tip that an old junkyard with acres of 1950s-era Chevys was ripe for picking. 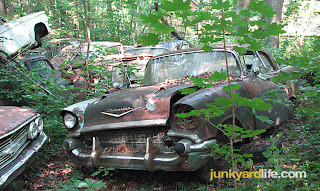 The defunct junkyard reportedly closed in the mid-1970s and sat untouched until the summer of 2010. That's when the property was involved in a land dispute with the nearby township of Dover, PA. The final result: the property deed was changing hands and the land would be cleared of all old cars and parts. Everything would be sold off before December 2010. Ron and Anthony found a junkyard jackpot! A graveyard of '50s and '60s Chevrolets includes this 1957 Bel Air Townsman station wagon in Dover, PA.
Ron and Anthony sacrificed a day of Carlisle's GM Nationals swap meet/car corral utopia for a chance to haul home some Pennsylvania junkyard artifacts. They found examples from GMs finest automotive decades – the 1950s and 1960s. 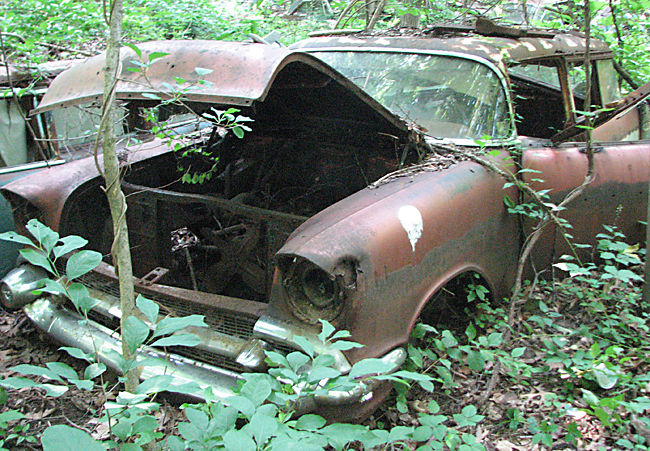 A handful of 1957 Chevy wagons littered the property. Prized Bel Air Nomads, 2 door sport wagons, were nowhere to be found. A four door Bel Air Townsman (above) featured a hot rodded hood. Umm, make that butchered and destroyed to make room for a high rise intake and air cleaner. Other wagons fared a bit better. A pair of windowed Two-Ten Handyman wagons were mostly in tact. 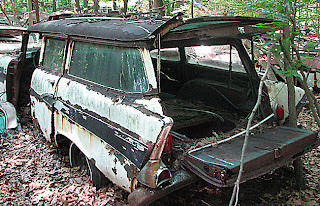 These 2 door wagons are relatively rare as GM built only 17,528 examples in 1957. 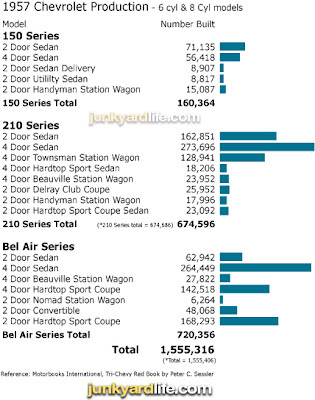 Many of these lower priced Handyman 2 door wagons were used as business delivery vehicles. 1957 Chevrolet Two-Ten Handyman 2-door station wagon. Mangled front view of the 1957 Chevrolet Two-Ten Handyman 2-door station wagon also pictured above. The junkyard duo ended their Pennsylvania junkyard adventure without hauling a rusting Chevy wagon 800-plus miles home. The original destination of Carlisle, PA. was pressing them for time but the guys didn't want to leave empty handed. Anthony negotiated a deal for some trim pieces from a '65 Buick Riviera. Not much of a treasure trove to bring back to Alabama but the memories and photos will endure. Stay tuned for more photos. A windowed 1957 Chevrolet Two-Ten Handyman 2-door station wagon. Is that a 283-V8 under the hood of a 1957 Chevrolet Two-Ten Handyman 2-door station wagon? 1973-75 Oldsmobile 442s sported louvered hoods as part of the W29 Appearance & Handling package. 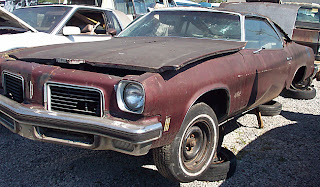 Oldsmobile Cutlass 4-4-2s have vanished from the streets! Before you get your Dr. Olds lab coat in a wad, I’m excluding cruise-ins and car show sightings. I’m talking about spotting true Cutlass 4-4-2 daily drivers, of the 1964-1979 vintage, guzzling fossil fuels. I’ll settle for something simple. Have you pulled alongside an Olds 442 in a parking space at your big box retailer? I say, not a chance! Oldsmobile built 7,204 Cutlass 442s during the 1974 model year. You don’t see 4-4-2s driven on public roads and I think I may know why. 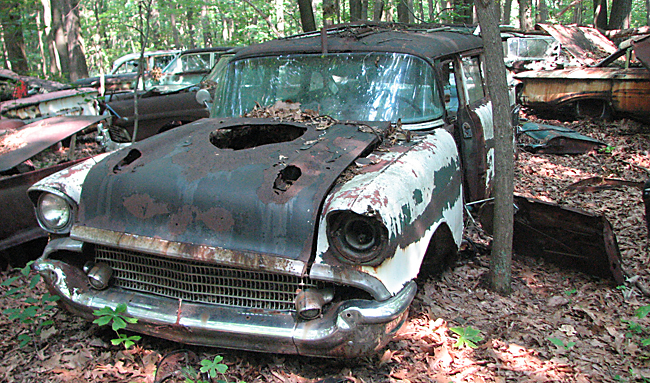 Maybe, on that fateful day in April 2004, when GM sent the Olds brand their walking papers, 4-4-2 fans began hiding their own pieces of Oldsmobile history. Locked safely behind garage doors or imprisoned in Uncle Bob’s storage building to keep prying eyes away. Could it be Olds 4-4-2 owners fear damaging their Olds-badged asset as they hedge their bets on a future payoff? Rust and rot around the 442s back glass leads to rust holes in trunk and quarter panels. That’s why I was astonished to find one, even though it’s a smog-era A-Body, at my local ‘pull-your-own parts’ junkyard. 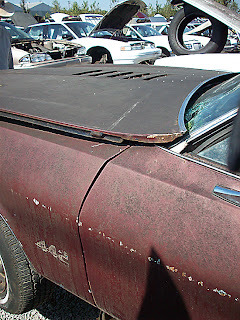 This 1974 Olds 442 with it’s non-functional louvered hood, looked fiercely neglected. For less than $40 I could have walked away with the unbolted hood which was a prime example of easy parts picking. Major rot inside the rear window glass channel is a sure-fire sign this fastback Olds has spent decades in the rain. Despite the disintegrating body panels, dozens of useable parts remained on this 4-4-2. Heavy duty 442-specific suspension parts, exhaust manifolds and swivel bucket seats are hot items to swap into any GM A-Body. 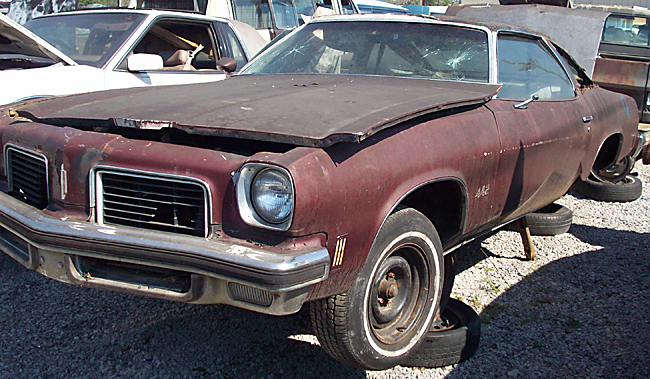 GM’s 1973-1977 Cutlass 4-4-2s were built on the A-body platform, also known by the Colonnade nomenclature. 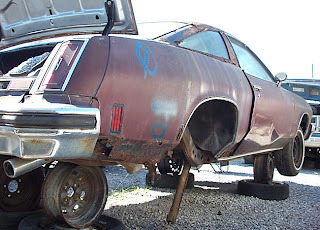 These were GM’s popular rear wheel drive, mid-size vehicles which competed in-house against Chevrolet Chevelles, Pontiac’s LeMans (GTO or Grand Am depending on year) and Buick Gran Sports. The sportier versions of these A-Bodies, packing big cubic inch V8s and manual transmissions, are becoming harder to find for cheap. 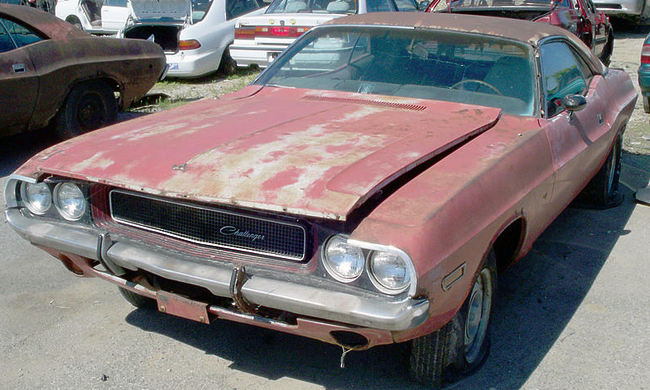 As these mid-70s cruisers continue to gain in popularity as affordable alternatives to "true" musclecars, perhaps fewer will end up meeting the crusher. 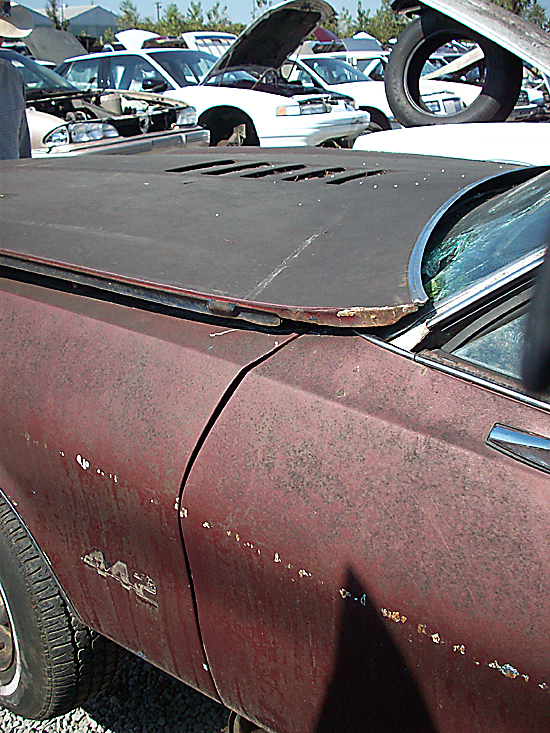 Try finding a 1973-’77 A-Body the next time your scavenging at your local junkyard. 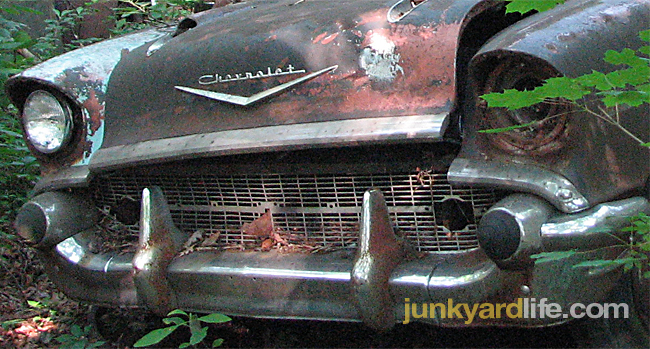 Send your photos and you might become a junkyardlife star. One man's junk car is another man's dream car. 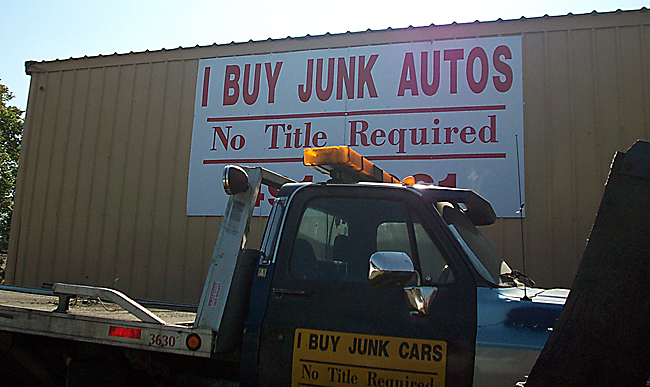 I buy junk cars. Don't we all? 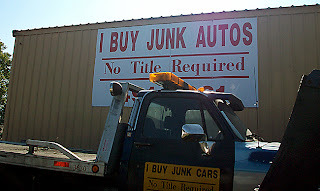 If you cruise along Highway 79 through Tarrant, Alabama you can't miss the island of misfit cars at 'I Buy Junk Cars'. Owner Steve Argo has been in the junk car and automotive repair business at this location for nine years. I pass by regularly and marvel at the ever-changing landscape of discarded vehicles. A white Porsche 944 caught my eye on a recent weekday, so I stopped in to get the lowdown on what appears to be a junk car dream job. Steve Argo, owner of ‘I Buy Junk Cars’ in Tarrant, Alabama. Argo lives a junkyardlife. He is a hard-working man who is not afraid to get his hands dirty. His business is hauling cars that are abandoned at apartment complexes or forsaken on the roadside. Many of the vehicles he encounters have been sitting in yards for years until the owner or city decides it's time to remove the rusting relic. "All the cars are in need of some repair," Argo says. "The owners usually find it easier to buy a new car, rather than put money in the old one." Often, some dusty but outdated imports arrive from the over-the-mountain (wealthy) crowd. Callers from Mountain Brook or Vestavia, who ask Argo for a few hundred bucks to haul away their old Jaguar, Mercedes or Porsche. I'm not kidding. Many of the cars he hauls from rental properties have had their title pawned. This inevitable headache requires Argo to send in paper work and make calls to lien holders. Sometimes he is reimbursed a repossession fee and the price he paid for the vehicle by a lien holder. Occasionally they don't want the car at all. Argo often times gets stuck amid the red tape. He currently has about 60 vehicles at another location waiting for paperwork to clear. Argo advertises and has a phone number on the side of his building. On more than one occasion, some too-good-to-be-true junk cars find him. Recently a guy pulled in and said he had a Corvette that he wanted to sell for $150. Argo thought, "Yeah right, a Corvette for $150." 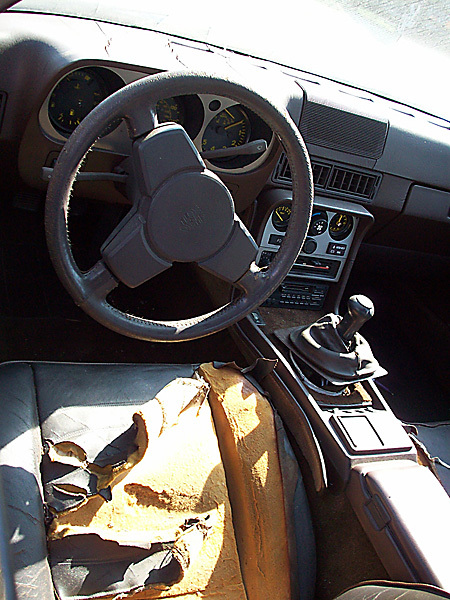 He followed the man to an apartment building and there sat a black, manual transmission 1986 Corvette. It ran but needed a clutch and some bodywork. The owner was moving to a new town and had to unload his neglected Vette. Argo didn't flinch when I offered to double or triple his money on the spot. No dice. Another good deal turned into Argo's daily driver, a 2003 Chevrolet Impala for $250. The Impala needed a fender and a door, but had only 54,000 miles on the odometer. The owner left it at a repair shop but never got the work done. The repair shop wanted it out of their lot. Argo was more than happy to help. The hard work involved in dealing with junk cars that are truly junk probably outweighs the glory of landing a vintage collectible. Argo has a waiting list of buyers looking for specific makes and models of vehicles. These are buyers hungry for one of Argo's 'good deals' on an older American classic. I mentioned that I would like to be on his list for early model Firebirds and Trans Ams when Argo said, "My favorite is the 1979 Trans Am." Argo grins and doesn't say a word. I know better than to ask for the top picks on everyone's dream car short list. 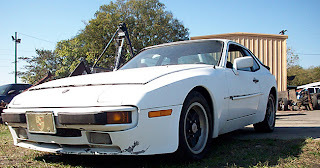 This well-worn 1984 Porsche 944 was spotted outside 'I Buy Junk Cars' in Tarrant, Alabama. Interior of 1984 Porsche 944 seen at I Buy Junk Car's lot.